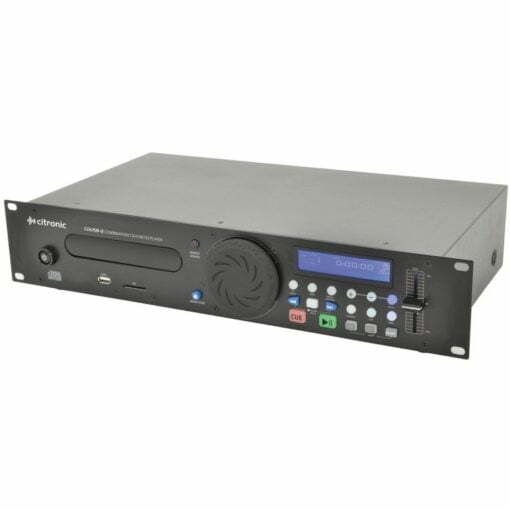 The Citronic Combination CD USB SD Player is a rack-mountable digital media player with full DJ controls including reverse, scratch and loop functions. A front loading disc player is accompanied by a USB port and SD card slot for playback of compressed audio tracks. CD playback is protected by an anti-shock system and can be pitch-controlled via a dedicated slider. Easy track and folder search buttons allow fast access whilst a large backlit display gives comprehensive track information. A professional sound source for DJs, dance & fitness instructors and background music installations. Please contact us. Or; why not visit our Facebook page and follow us? See ALL the latest info as it happens!